Taya Lee Flute is a quiet, doe-eyed sweetheart.She is very friendly and trainable.She possesses a big loose walk, a ground-covering trot with plenty of knee and hock action to work with and her canter is supple and flowing. Flute is one of the first �almost ready for riding� age progeny of the beautiful Royal show-winning stallion Kaludah Schumann. Schumann is by the well-known imported stallion Salute (dec), sire of international Grand Prix dressage horse GV Stirling Stilton, NSW state GP champion DP Christopher and world No 1 ranked eventing stallion Staccato. His dam�s sire, Gullit, was the Olympic GP ride of Carl Hester (UK). 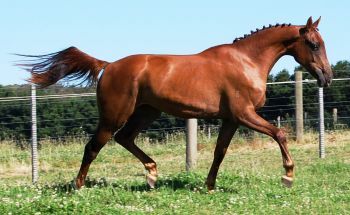 She carries Cor de la Bryere blood and is related to Olympic Ferro.